Happy July! We had a relatively scorching hot, sunny day in London yesterday. It was glorious, if a little bit of a shock to the system 😉 “Change” is threatened, with a glimmer of hope for next weekend, but we won’t be holding our breath too much. Anyone for tennis? The tournament has so far been full of surprises, I wish I were there in the sun today – have any of you watched Wimbledon in person? Talking about surprises, I have been the grateful beneficiary of a few very pleasant ones over the past half a year or so – a few awards that I have regrettably been remiss to acknowledge properly. My sincere apologies to five lovely bloggers who have dropped such thoughtful gifts of encouragement on my blog along the way and made me smile. They were especially meaningful as I was struggling to get words out and not actually writing a lot at the times when I received them! As I have said in the past, I am so touched by the generous kindness out there from all of you. My heartfelt thanks for reading and holding conversations here! This time I’m going to break all the rules of awards there ever were, and do my own thing! First of all, I hope you will forgive me for not nominating any other bloggers for the awards below. I wanted to acknowledge the people who gave them to me, but I will not be writing any more award posts after this one. I’ve recently started using my Facebook page to share blog posts that have inspired and challenged me. That way I have a focus for Facebook and a focus for the blog – I can share posts I’ve enjoyed easily as I read, rather than dawdling half a year to write something like this! I hope you’ll check my page out, click like to subscribe if you do indeed like it and please visit the links from posts I’ve enjoyed and share the love! Secondly, one of the good friends of this blog, Diana, shared a post about personality colours not so long ago and I went and googled it and found this file. It’s a short version of the real thing I’m guessing, but a whole lot of fun! I wonder what colour you are – do have a go and let me know in the comments below what you think and what colour you are… I’m BLUE 🙂 Exactly what I would actually have expected! Thirdly, just because I’d love to find out some random things about you dear readers, feel free to answer the following questions on your blogs and link back in the comments to let me know you’ve done it! Sun or snow? Definitely sun. But not hot and humid if I get a say – I actually love sunny winter days when everything feels crisp and fresh, hot with breezy shade is herrrrrlich too. Love snow too, preferably not in London though! Do you listen to music while you are working on something? Only if I don’t need to focus very intensely. If I’m writing (e.g. blogging) it’s got to be instrumental music, I get very distracted if there is singing or talking in the background, especially if I like the song or find the conversation interesting. But if I’m doing chores, cooking or painting for example, music helps to motivate and focus me and beats are great! Evenings in or out? I prefer no more than one or two nights out a week if it’s with a group of people. Coffee with one or two friends at a time don’t count as I love to sit back, people watch and have a lazy natter! I love a bustling house too and prefer entertaining at home simply, without fuss. Thank you to A Nerdy Crocheter for the Liebster Blog award. Her beautifully crocheted projects are an inspiration and pleasure to read about, do go on over and get ready to admire her work! Thank you to a Licking the plate again for the Beautiful Blogger award. Click through for a very tasty, travelling view of the world, and another view of the UK from a slightly more northerly perspective. And last but not least, thank you to Alicia for the Shine On award (I’m not soo late in writing about this award ;)) She has been taking part in a challenge to write every day for a month, so go and check it out! Categories: LEMONADE, Meaningful Mondays | Tags: award, blogging, Facebook, friends, July, nomination, personality, sunshine, True Colours | Permalink. I wish sneezing would banish mosquitoes from around me! I have sustained five bites overnight in the most aggravating way. I hate waking up to the evidence that something has taken a leisurely stroll down my leg, sucking my blood. Gross and totally uncalled for if you ask me. All I ever did was aggressively exact revenge on two of your species in the past week with my slipper *thwack*! That is no justice for the total of ten bites and counting… An average of one per day. Grrrrr! The crazy thing is, mosquitoes are totally out of season here right now. But this year’s weather has been out of kilter all around the world it seems. I’ve seen news of more flooding in the UK. I hope everyone is ok back in good ol’Blighty? I thought I’d post a cheerful photo to help make the lemons easier to swallow. I flew Virgin Atlantic last week and was given a mini tube of Love Hearts as we were preparing for landing. I do dislike long haul flights and would not choose to take them if I had the choice. But I do find marketing and consumer psychology interesting! I’m not adverse to allowing myself to appreciate the quintessentially British style that Virgin employs. No milky coloured pile of mints for them on the approach to your destination. Just some playful and nostalgic (if you’re a Brit) compensation for having suffered the discomfort of embedding your knees into the passenger in front for the last eternity. And my last Love Heart is a message for you this week. Framed by my favourite pen to travel with. My fun Muji 5-colour plus pencil contraption (also somewhat nostalgic – did I ever mention that I love stationery?) Have a very blessed week, whatever you are facing. I desperately miss home with its cold early evenings, frosty mornings, proper dark and neon light deficiency, easy accessibility to good cheese, strong black tea that goes well with milk, slightly less unpredictable weather and hibernating bitey things. When you are away from where you call home, what do miss the most? 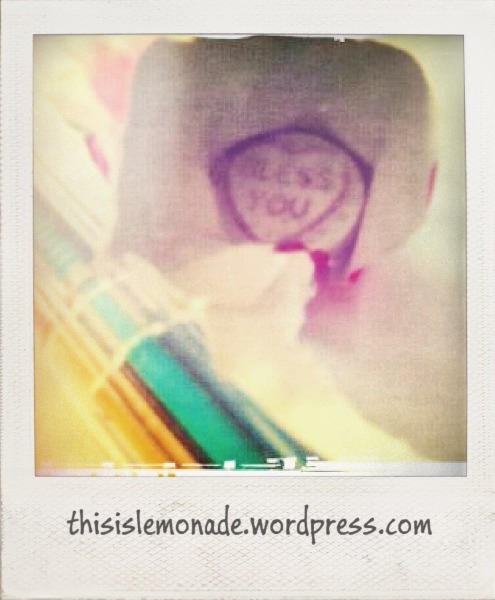 Categories: LEMONADE, Meaningful Mondays | Tags: bites, cold, home, Love Hearts, marketing, mosquitoes, photo, travel, Virgin Atlantic, weather | Permalink. If I believed in previous lives I could, without a doubt, tell you that I was an ostrich. Actually, forget about multiple reincarnations. I am an ostrich mocked up as a human being. (I just got a picture of that. It’s ridiculous.) I am an expert in living in denial, pretending like it’s never going to happen so that it will go away. At times, I have been known to completely refuse to prepare for something that is bound to happen, because I feel so overwhelmed by what I have to face. I end up panicking and doing everything last minute, or even having to wing it. Stupid, I’m telling you. If only I could bring myself to pop over for tea with Her Majesty from time to time, I’d have been the first decorated ostrich in the Kingdom a long time ago. I am so accomplished at digging holes in sand where there isn’t even any sand around! I do not just buckle at fears. I mean, this applies to how I tackle fail at packing for travel too. I see a myriad items and pieces of clothing that I have to collect from all corners of the house, and I envisage an organised and packed suitcase. And the conclusion I invariably draw, is that I can make the one turn into the other by sheer willpower and remaining completely immobile. A procrastinating ostrich is a terrible beast. I suppose much of my inaction is related to things I desperately do not want to do, places I do not want to go. I often have a choice in these matters, but I know that I should make the choice that I do not want to. So, I try to make it all go away by sticking my head stubbornly in the sand and chewing it. Fears, as we all know, do not have to be rational. After we have talked ourselves into being ok with something, we can still get to the point of almost getting into gear to face it, only to suddenly and completely freeze. On the other hand, I have some real, deep-seated fears that propel me into positive action. The desire to overcome them, motivates me to try to tackle them. I do not like heights. I know in my mind that there is nothing to fear, and yet my body will tense up and it will be a mission to keep going. What really annoys me, is that my fear is tied to my lack of confidence in my own body to keep me upright. I’m not even talking about scaling a high mountain. I’m talking about the inability to walk up a tame hillside when the wind is approaching from the wrong direction. Perhaps it isn’t so much a fear of heights, as a fear of falling. And it doesn’t have to be falling from a great height either. Perhaps my fear is of a loss of control. Of stumbling into an indefinite slide and tumble…I fear…hiking. There I’ve said it. Snigger all you like. It absolutely infuriates me. I LOVE the outdoors. I LOVE walking. When I lived in Hamburg, one of my favourite things was the German obsession with the Spaziergang. The culture of taking a leisurely walk with friends, combining with my other passion – a good ole natter. Finding a good coffee and cake or ice cream along the way never hurt either. However, today’s story is a little more positive. There is hope yet. Earlier this year, as the Olympic torch was passing through Stroud, I was on my way up the beautiful Malvern Hills. I took a gentle route starting not far below St Ann’s Well, approaching from a steep little road going away from town past some lovely cottages. I made my way up towards the Beacon, the highest point along this beautiful hill range. Most of the way has well laid footpaths to make it accessible to more people, although scree does make me nervous when I am going downhill. As you approach the Worcestershire Beacon however, there is a short part of the route that requires a gentle amble up well worn but slightly more undulating paths. The weather was beautiful – sunny, but with a good breeze. Having almost reached the hilltop, the wind was quite spectacular. In fact, that was the reason why my walking companion wanted us to go up there. And, having made it to the top of the hill, except for another ten metres or so, that’s where I buckled. With the hillside gently sloping away, I settled in a little nook just below the summit, where there was shelter from the wind. I decided, I thought, that I had made it just shy of the top and it was a good achievement. But then, I caught sight of the toposcope at the very peak, designed by Malvern architect Arthur Troyte Griffith. To be precise, I caught sight of the words on the side of it that told me that it was erected to commemorate the Diamond Jubilee of Queen Victoria in 1897. Fortunately for me, I made my first ascent of the Malvern Hills in Queen Elizabeth II’s Diamond Jubilee year, at a time when the country was in great anticipation of the Olympic Games. It gave me that extra impetus to brave the wind, and practically crawl up to the very summit. Yes indeed, Queen Vic gave me a kick up the bum and told me to do those last ten metres since I was up there already. I was not likely to get another chance to do something so momentous for another little while, so I might as well just do it. To end, I may be mostly ostrich-like, but I do have my moments of brilliance when I will kick into reverse-ostrich mode and find some grit to make me do things that continue to amaze me afterwards. These moments may mean nothing to someone like the poor cyclist or a couple who preceded us up the hill, one with a child on his back and the other pushing a buggy with another child clambering about in front of her. But for me, they are moments where I made a brave decision, and half a year later that shrieking moment still makes me smile just thinking back to it. There is no lemonade bubblier and sweeter than that. If you are interested, here is a YouTube video I stumbled across whilst writing this post. Jon Bywater kindly shot some footage of their little amble up the hill and it’s lovely. Categories: LEMONADE, Meaningful Mondays | Tags: courage, Diamond Jubilee, dreams, encouragement, fear, inspiration, Lake District, life, London 2012, Malvern Hills, Olympics, photography, Wainwright | Permalink.